If a tablet is being used this slider will show the current pressure. This slider will give the numerical ID for the most recently pressed key on the keyboard. Modifier keys (Ctrl, Shift, Alt) have their values added to the selected key. The current Mouse/Pen Horizontal Position. Zero is the left edge of the ZBrush window. The current Mouse/Pen Vertical Position. Zero is the top edge of the ZBrush window. The slider gives the numerical ID for the interface item under the cursor. For example, if the cursor is over the canvas then the value will be 1004. The Temp Values sliders can be used by plugins to store temporary values. 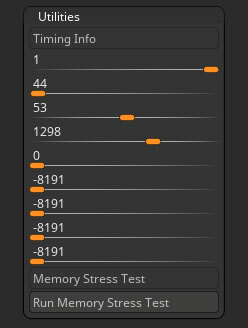 Run a Memory Stress Test.